On J20, the day of the presidential inauguration, 227 PCS students–41 percent of the PCS student body–participated in the J20 school walkouts and political protests which occurred across the country in concert with the swearing in of Donald Trump as the 45th president of the United State. The walkout began around 10:30 a.m. in coordination with students from UCSC, Harbor High School, Monarch Elementary and various other local schools. Students from PCS walked out of the school building, met a crowd of supporters from UCSC, and afterwards, as a large group, proceeded on Mission Street, towards the clock tower in downtown Santa Cruz. In the protests on J20 and the weekend that followed, millions of people across the nation participated in walkouts, protests, and rallies to protest President Donald Trump’s campaign and policies and express support for the social groups and issues maligned in this presidential election cycle. The J20 student walkout at PCS was organized by the PCS Feminist Coalition, who communicated with the City of Santa Cruz and neighboring schools such as the University of California Santa Cruz to coordinate their protest efforts. Students planning to walk out were strongly advised to receive permission for their parents or guardians to do so, as the goal was not to protest PCS. The school did not sponsor or support the protest. According to Janelle Christensen in the PCS front office, 227 PCS students out of a total student body of 551, participated in the walkout–225 students had parental permission to leave campus at 10:30 a.m., while 2 students left without parent permission. Throughout the week of the protest, students ranging from grades 7-12 met during lunch everyday to construct posters for the protests. The posters needed to abide by the rule, suggest by Feminist Coalition leaders, that this protest was designed to protest Trump’s policies, but not his presidency. Students were also encouraged to bring a parent chaperone to the walkout to make the experience safer. The ROAR had the opportunity to interview many students who walked out. Some simply walked out of school, which was enough of a statement. Miles Voenell, a ninth-grader, for example, walked out and then went directly home. However, many went further and proceeded to march downtown to meet by the clocktower. Abigail Tiller, also a ninth-grader here, felt “grateful…and so proud that hundreds of PCS students made their voices heard and stood up for what they believed in..and that they will raise their voices when people around the country are being wrongfully silenced”. Em Ilstrup, a PCS freshman, noted that the biggest thing she learned from the protest was “to hold out hope.” Emma Payne, a junior, drove to the downtown protests, but “wished that [she] walked with the rest of the school.” Many students who participated in the walkout and protests downtown were very surprised about the large turnout. The cars on Mission Street were stopped in the traffic congestion and protesters were both on the sidewalks and walking through traffic. Many students wore “We Can Do It!” pins made by junior Tovah Popilsky. 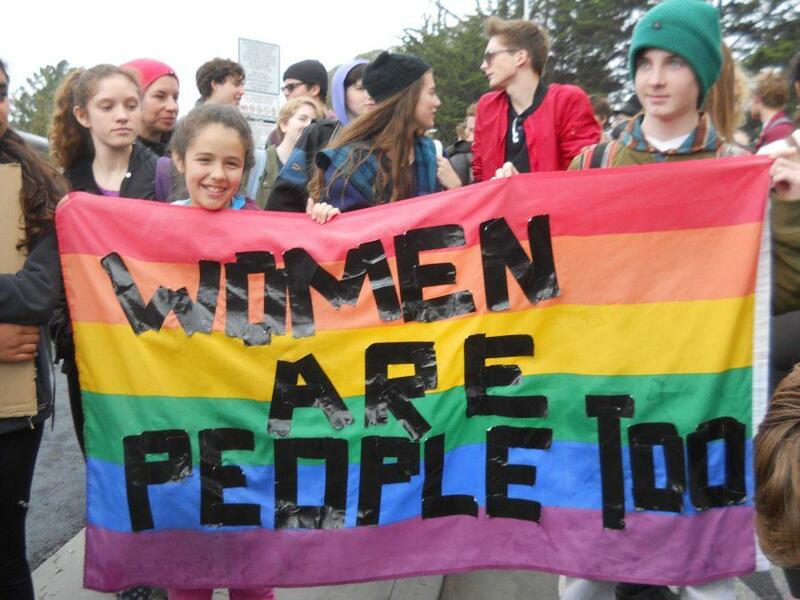 Numerous PCS Students voiced their opinions on social media about the election, and many attended the Women’s March in Santa Cruz the day after. Overall, the students who attended the walkout seemed to have a very positive experience and learned a tremendous amount of new ideas from it. Many highlighted that was is important that they stood up for what they believe in in solidarity with the reported 2-4 million Americans who participated in political protests on J20 and the weekend of the presidential inauguration. The ROAR: Did you partake in the pcs walkout? Student: I did participate in it. The ROAR: Is there a certain thing or action that Donald Trump said that motivated you to participate in the walkout? Student: I think the way Trump treats women and his inability to believe in climate change were the biggest issues for me. The ROAR: What problems do you think Trump will create? Student: I think Trump could start a war with another country because of the things he says. The ROAR: Why do you think most people protested? Student: I think the rest of PCS’ answers would be similar to mine, but I think the biggest issue would be the tape of Trump were he said some very offensive things to women.